I am super happy to introduce my newest sponsor, a collective of vintage pattern sellers and the lovely lady behind the scenes. I've asked Jill from the Vintage Pattern Collective some questions about vintage sewing and the collective....read on and be inspired to go vintage! Jill's family's connection to sewing is what got her to help her mother start Vogue Vixens, which lead to involvement with Pattern Patter, and eventually taking over running the Vintage Pattern Collective. While it is a business, it is definitely more a labour of love, that has developed into a better connection between Jill and her mother. It’s great that you’ve been able to form a collective with other Vintage Pattern sellers. Can you tell us a little bit more about the collective? How did it start? What are some of the ways in which the members of the Vintage Pattern Collective work together? We are a collective of women-run small pattern supply shops on Etsy, an extension of the Pattern Patter Team. Our members love preserving, collecting, and selling vintage and newer sewing patterns - many of us are sewers too! We help each other with advice on pattern dating, pricing, and repairing. There is business mentoring on customer service, photography, pattern listings, and social media. If one of us has a pattern request that we cannot fulfill or is looking for a missing pattern piece or instructions, we reach out to our teammates for help. On a personal level, we have formed friendships, and support each other through highs and lows. As small individual shops on a such a large website, it can be a struggle to be found, to draw traffic. The Vintage Pattern Collective formed as an advertising program so that many of our little Etsy shops could band together and use our combined buying power to buy ads on blogs and get noticed. The Vintage Pattern Collective has 29 members, each with a stock of sewing patterns that are thoroughly checked for quality and counted for completeness. Our member's collections range from the 1920's, to modern patterns, there are patterns for women, men, children, as well as crafts and home decor. You have a few free patterns and resources available on your site. One of the things I've enjoyed most about the online sewing community is how people are so helpful and willing to share. Tell us a bit about the resources and if anything else is planned for this section of the site. Under the Resources section of the Vintage PatternCollective website we have posted vintage publications from Dritz on Layout, Cutting & Marking, and Pressing as you Sew. There is the Getting Ready to Sew with advice on the tools and layout for a sewing room, as well as a marvelous guide to taking body measurements. There are also sewing tips, a booklet on alterations, and a needle and thread size guide. Old advice is still good advice! The Free Patterns sections has vintage sewing patterns for an apron, hat, bag, circle skirt as well as a few more accessories. We do plan on adding more free patterns, it's just a question of finding patterns that are in the public domain. What are your plans for the Vintage Sewing Blog? With the help of some of our talented members, the plan is to start a Blog at Vintage Pattern Collective, with at least one post a month. It seems that sewing with vintage patterns is so much more than a “fad” or passing phase. Would you say it has continued to increase in popularity? There is a feeling of more freedom in fashion today, if you don't like the "hottest" trends, you can turn to the past to find and sew a look that suits you. In my mind this is one of the reasons for increased interest in vintage patterns. Vintage patterns tend to not have so much "ease" built in, the fitting is different and some sewers prefer that. As our society becomes increasingly digital, there is also some appreciation for the fragility and rarity of paper patterns. 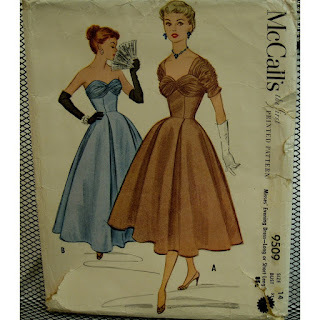 There are those that enjoy vintage patterns, just for the illustrations, a fashion time capsule. How did you discover vintage pattern sewing? Do you have a favourite pattern or outfit you’ve made? I'll admit that I'm a terrible sewer born to a family of marvelous seamstresses. Recently I discovered that my grandmother Justina was known as the unofficial town seamstress, while still finding time to raise 6 children and drive the town schoolbus! She mainly sewed gowns for weddings, dances and graduation. Her skills were used at home to rework clothing to keep all her children well dressed. My favourite Christmas story is how my mother desperately wanted a Princess Elizabeth doll, which my grandparents could not afford. On Christmas morning she ran to the tree to discover her wish had come true! On closer inspection she realized it was her own doll, dress in a Princess Elizabeth wardrobe that my grandmother had painstakingly recreated. 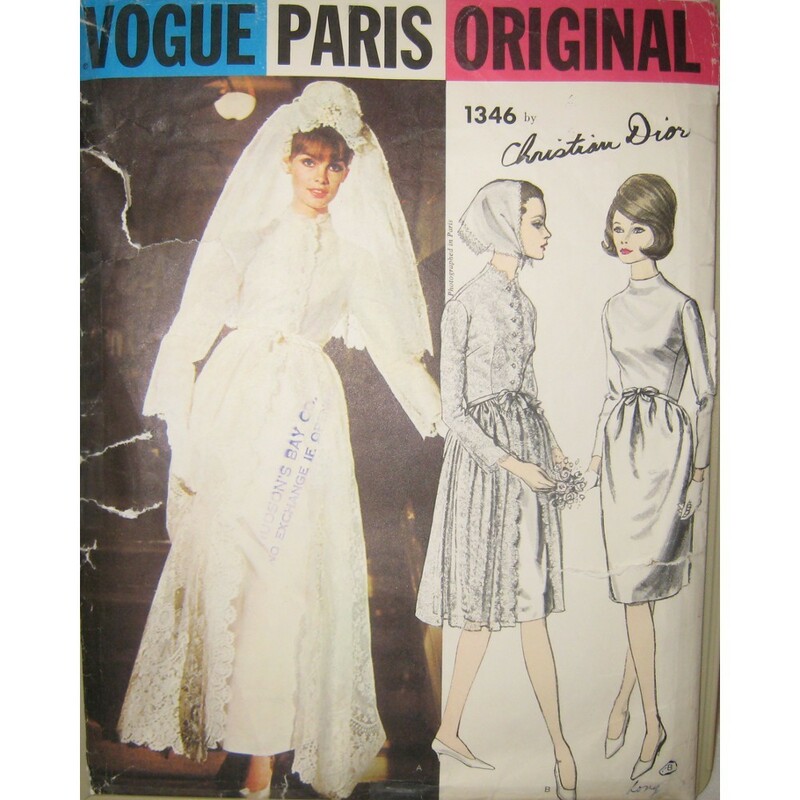 My mother Karen and her pattern collection is the heart of our shop - Vogue Vixens. She started sewing as a teen, and she sewed for her family and herself until just a few years ago. Dresses, pajamas, curtains, dance costumes, you name it, she sewed it. She kept all her patterns, and I loved to flip through them as a child, playing in her sewing room, the colourful illustrations were fascinating. As I got older, if I wanted a new outfit, it was my job to lay out the pattern on the fabric and cut out the pieces, as well as sew the hem and buttons. 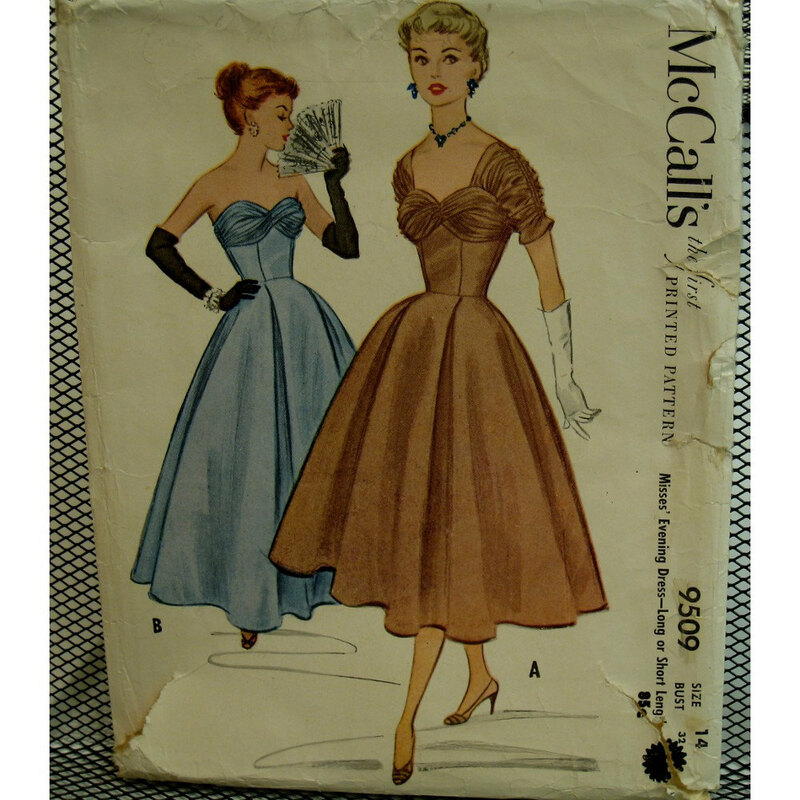 The bust of this classic McCall's dress has ruching. Instead, the bodice for my dress was strapless, with a surplice detail, and of course boning for support. 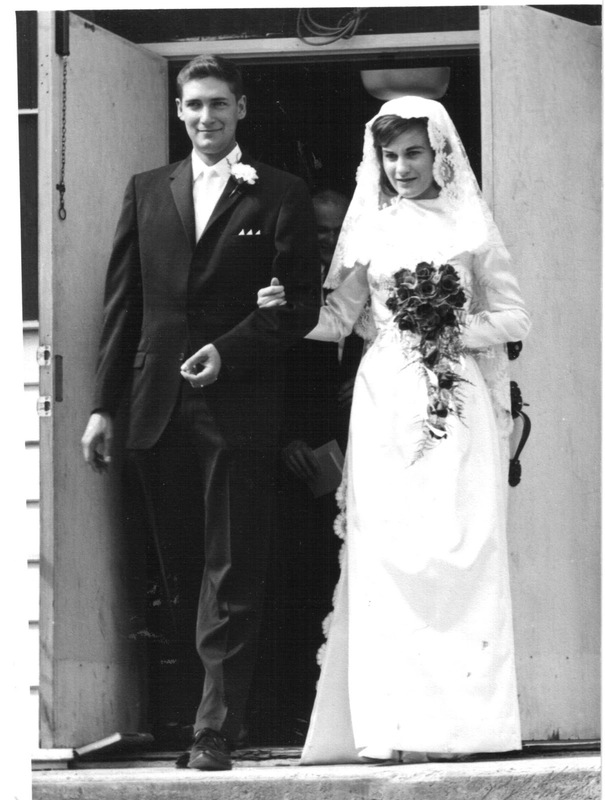 Mom even made a crinoline so I would have a full skirt look. A strange connection; one of the first patterns sold in our shop was the pattern for my Mother's wedding dress – a Vogue Dior pattern that my grandmother only used for the bodice! What advice would you give to someone who is interested in learning how to sew vintage patterns but has never sewn before? When choosing a vintage pattern, compare your measurements and choose a pattern that matches your bust size, as it is always easier to adjust a pattern at the hips and waist. My other suggestion if you are a beginner is to start with simple patterns as you learn and gain confidence. There are lovely shift dresses from the 1960's and 70's where the fit is looser, and these are more forgiving. What's next for the Vintage Pattern Collective? Developing the blog is what is foremost on my mind, January is the projected launch. Thank you so much, Jill, for sharing these resources and history of the collective. I'm super excited about the Vintage Pattern Collective, as it contains many of my favourite vintage pattern sellers! Check out the full list here with links to their Etsy stores. Happy Sewing!